MS: Pokémon Go is an example of augmented reality, but AR has traditionally been less popular than VR. Could this be AR’s killer app? SSS: Yes, of course! Even the creators of Pokémon Go did not anticipate that it would be so wildly successful. For the last dozen or so years, scholars and designers interested in AR have been looking for a “killer app” to sell the technology to the masses. Most of the AR products thus far simply overlaid text on top of real-world objects and scenes, much like a QR code. While this is cool for someone looking to get extra information about a particular location (e.g., nearby restaurants in Yelp) or object (e.g., background information on a painting), it did not catch the public imagination because it was seen primarily as a kind of footnote. Who wants or reads footnotes? Just academics and those who are highly motivated to learn. Not those who are looking for fun. MS: Why do you think the game is so popular? SSS: Because it is fun, delivered in an innovative package that is not only magical and mystical, but also reflective of current trends in personal and social media use. The mysticism comes from the apparitional presence of characters that evoke nostalgia (many players grew up on Pokémon). It’s as if these characters have come to life, and what’s more, living somewhere in our midst. The genius of the game is that it creates a bit of mystery around their location, egging users to go after them, much like in a safari. There are very few things in life that are as exciting as spotting wildlife! In addition, the game capitalizes on the current popularity of quantified self and social media, by incentivizing users to go out in the real world and be physically and socially active. MS: Is Pokémon Go an example of gamification? SSS: Yes, there are definitely some game elements in it, especially when it comes to capturing the creatures and battling with them. But, gamification is not the novel part of its appeal. 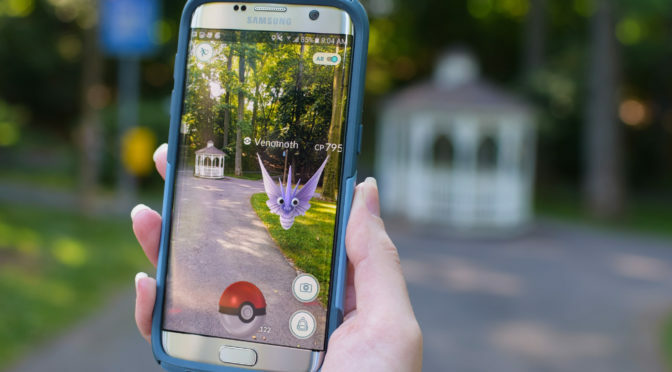 Pokémon has long been gamified in a variety of platforms, but the combination of AR, treasure-hunting, and emphasis on physical activity makes this uniquely appealing. MS: I’m wondering how researchers who study AR and VR are reacting to the Pokémon Go app craze? What is the future of augmented reality research? SSS: I think researchers are heaving a sigh of relief! For years, they have been extolling the virtues of AR, but there haven’t been many takers — primarily because there weren’t any cool AR products in the marketplace. Meetings of the International Symposium on Mixed and Augmented Reality (ISMAR) have, for the last 14 years, been preoccupied with finding a killer app that can sell the technology to the masses. This September, at the 15th meeting in Merida, Mexico, the conversation will likely be different, focused on one central question: What can we learn from Pokémon Go’s success? MS: Is this a sign that AR will surpass VR in interest? SSS: Not really. It is certainly a sign that AR, which is less expensive than VR, can be a viable technology for creating compelling consumer products. But, VR holds its own fascination because it creates a completely virtual world in which we can get immersed –much like we do with a good movie. Moreover, VR is becoming more affordable, thanks to Oculus Rift and Samsung Gear VR which have brought head-mounted VR to the consumer marketplace in recent years. That is, we can now experience VR without having to walk into a CAVE or other specially designed facilities for 3-D projection. All we need to do is slip our smartphone into a cheap headset and we will be transported into a virtual environment that is interactive, i.e., responsive to our actions. For more on augmented reality and the Pokémon Go craze, check out Sundar’s recent column in the magazine Outlook. Members of the news media interested in talking to Sundar should contact Matt Swayne at 814-865-5774 or mls29@psu.edu.